In June, the stately colonial homes and more modest cottages of Edgartown are equally resplendent with lush green flowering plants and shrubs. The freshly painted white picket fences scream out to passersby that a new season has begun. Of course, low enough to hop over, they are intended for eye-appeal rather than security. 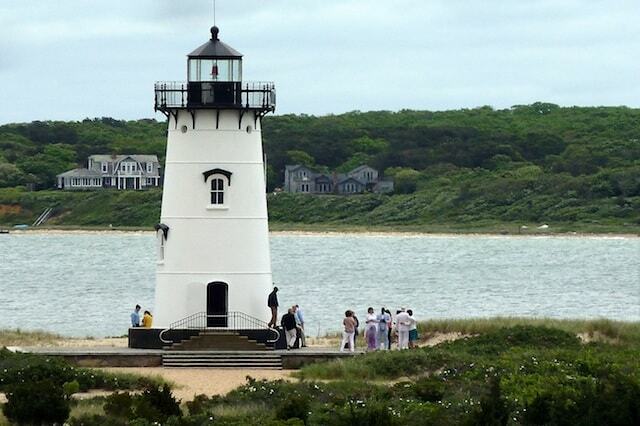 The 100-square-mile island affectionately known as the Vineyard is comprised of six beach towns with lots of open space between them — the “up-island” towns of Aquinnah, Chilmark and West Tisbury, and the “down-island” towns of Oak Bluffs, Vineyard Haven (also known as Tisbury), and Edgartown. Like siblings, the towns are related but vary in style and temperament. Between May and October, tourists and seasonal residents flock here as an antidote to harsh northeastern winters and to the hectic pace of their everyday lives — in pursuit of the beach, rolling woods, and relaxed ambiance. They join a stalwart contingent of full-time islanders pretty seamlessly, although car and bicycle traffic in the downtown areas slows as the population swells almost five-fold to 100,000. On summer weekends, adding to the mix, another 25,000 day-trippers come and go on ferries. Open year-round, the historic Harbor View Hotel (which dates back to 1891) is located on North Water Street in Edgartown — on the easternmost portion of the Vineyard. During the heyday of the whaling industry, wealthy ship captains resided along this elm-lined street. Many of the white clapboard homes still bear the names of individual captains with the dates of construction marked above the doors. Fronting on the street, the hotel is actually a cluster of three buildings: the Main Building, the Governor Mayhew Building, and the Captain Cottages. Although larger in scale than most nearby residences, the property is of a similar vintage and architectural design. There’s a welcoming private pool with a brick deck in the backyard and the hotel is just a short walk from public beaches. The main building’s wrap-around porch sports high-back rockers painted seafoam green that invite guests to sit back and inhale the ocean air as they read, nap, or catch a few rays. It offers commanding views of the harbor, Chappaquiddick Island, and the iconic Edgartown Lighthouse that juts into the sea at the end of a white seashell path across the road. The federal government recently announced that to save money, it is putting the beacon up for auction since it is no longer considered “mission critical” to the Coast Guard. As a result, the town is looking into acquiring the property. The airy hotel lobby is furnished with comfortable rattan and upholstery seating, and has plenty of windows that allow natural light to stream in. Model boats are displayed here, replicas of the ones guests can rent (with a captain) and take out on the harbor. Both picnic and sunset cruises, which can be chartered or rented per person for a maximum of six people, launch from the hotel’s private dock. The 39-foot Stardust is a beautifully refurbished, Bunker and Ellis mahogany yacht originally built in 1966. The fleet also includes another powerboat and two sailboats for guests who want take sailing lessons. Service is helpful and friendly; many of the young staff return season after season. The property is welcoming to children (there’s a supervised Kid’s Club program) and pets. The public areas, including the glass-enclosed “Water Street” dining room, are elegant but relaxed. During the evenings, the romantic lobby fireplace or the intimate Henry’s Hotel Bar seem to beckon couples. Many guests come to celebrate honeymoons or milestone anniversaries. A member of Historic Hotels of America, Harbor View is beautifully maintained. But unlike many cookie-cutter hotels, the upper floors of the Main Building creak from old age and part of its charm is that no two guestrooms look exactly the same. With both a front and back staircase, you feel as if you are staying at someone’s family mansion. There are a total of 114 rooms on the property, including some three-bedroom cottage suites, many with pool, ocean or garden views. On the first weekend in June, my husband and I stayed in Room 222 in the Main Building. Renovated about four years ago, the room was updated and spacious with a comfortable king-sized bed. A pillowed window seat beneath the bay window faced the treed driveway entrance on the side of the hotel. The bathroom and room décor were standard but made for a pleasant stay. The new executive chef at Harbor View, Shaun Sells, is a graduate of Johnson & Wales University in Rhode Island. His menu puts a contemporary twist on classic New England fare, including plenty of locally sourced fish and produce. The sumptuous Sunday buffet brunch, which includes a raw bar and omelet station, is a steal at $28 per person. Although this self-contained resort has everything on premises to keep guests from straying, the beauty and diversity of the island invite exploration. Edgartown’s downtown area hosts an eclectic collection of boutiques, B&Bs, restaurants, inns, and art galleries that are about a five-minute walk from the hotel. Most of the shops are more traditional than trendy, more preppy than glitzy. You can take drive, ride bicycles, or take public buses to get around if you want to go farther. The hotel concierge can arrange tee times, bike rentals, adventure tours, and water sports. It’s easy to understand why people return year after year. Each visit promises new discoveries in a setting steeped in tradition. There are daily, year-round flights to Martha’s Vineyard from Boston, Hyannis, New Bedford, Martha’s Vineyard, Nantucket and Providence, Rhode Island as well as new seasonal non-stop service from White Plains, New York on Cape Air. Ferries to the Island sail from Falmouth, Hyannis, Nantucket, New Bedford and Woods Hole in Massachusetts; Quonset Point in Rhode Island; Montauk and New York City in New York. Sounds lovely. It’s unusual for a hotel of this sort to have king-sized beds, don’t you think? That’s a selling point me me and my husband right there. And, we happen to love Martha’s Vineyard.